Thanks to everyone who commented or sent me input on the best tear away stabilizer. I enjoyed reading all about it and still want to try the EQ paper. While teaching this weekend at the Sewing and Quilting Expo in Platteville, WI, a student in one of my classes said that she recently foundation pieced a pineapple log cabin quilt using a wash away foundation and she was pleased with the results. I asked her to send me the name of the one she liked and I will pass it along to you. Do you have any thoughts on wash aways? Since we’re on the subject of foundation/paper piecing, I thought I’d share a new gadget I was introduced to in a workshop I took in Paducah with RaNae Merrill. RaNae foundation pieces amazing Spiral Mandala quilts. One of the problems brought on by the flood in Paducah this year was that the church where the classes ended up being held didn’t have the right electric set up for multiple irons. Therefore, when RaNae introduced us to pressing with wall paper rollers, it was a hit. She said the little, wooden “finger irons” had a tendency to stretch the fabric, but the roller didn’t. I’ve tried the finger iron and I didn’t find it worked that well. The picture shows the correct way to hold it to reduce stress on the neck of the roller and the arm of the quilter too :-). Do you have any favorite foundation piecing tips or tools? i have used the wooden iron, lots of time I use my fingernail, when they are in good shape :>) Thanks for the link to the proposed Olympic logos. Very pretty. I hope they choose those designs! I used Collins Washaway Foundation paper many years ago for a lone star variation quilt. I kept the papers in until the top was together and when I put it in water I got a HUGE amount of lint all over the quilt. Took forever to get it off. I’m surprised I could find the leftover package since I will never use it again. Thanks for the warning. I’m glad I asked! makes it easier to see to position the pieces from the back side. I will check out the roller though. I love to foundation paper piece & I wouldn’t consider doing it without wash away paper. I’ve tried a few varieties & their all about the same. You can put it in your printer to make multiple copies. The weight of the paper is just right so it doesn’t fall apart even on big projects. Speaking of big projects, you also want the wash away tape. It’s about l/4″ & can be used on tears or putting foundation pages together. I may have to look into that foller. I have a small, narrow June Taylor combo cutting mat/ironing surface(all on the same side) & one of those cute mini irons. You have such a wonderful and informative blog that I can go back and refer to again and again. 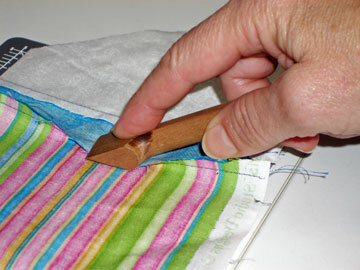 I love the idea of the roller vs. a presser for “finger pressing” seams. Must try. I found all the information here to be great. I can hardly wait to get started.